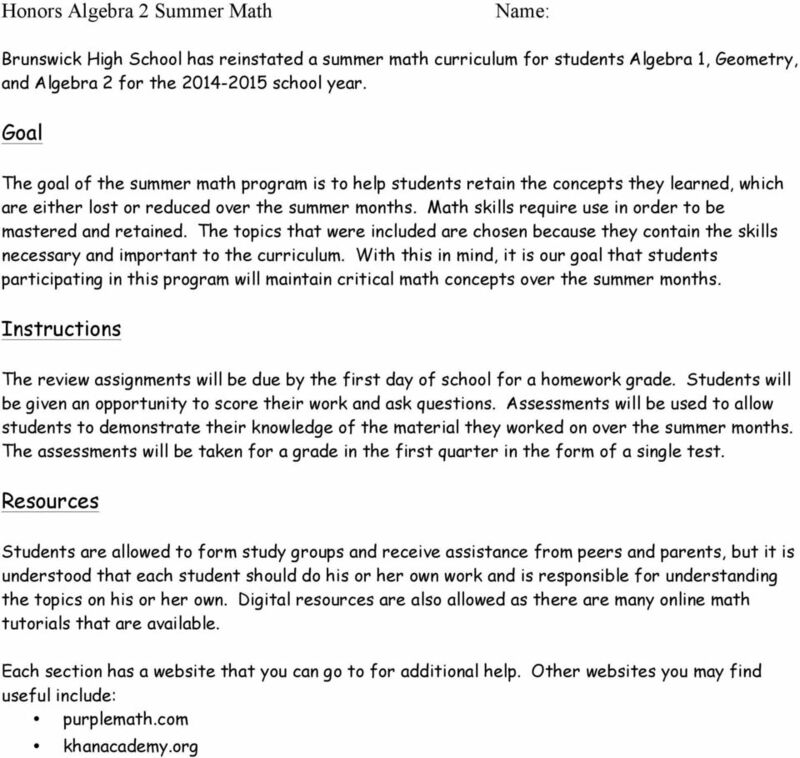 Brunswick High School has reinstated a summer math curriculum for students Algebra 1, Geometry, and Algebra 2 for the school year. 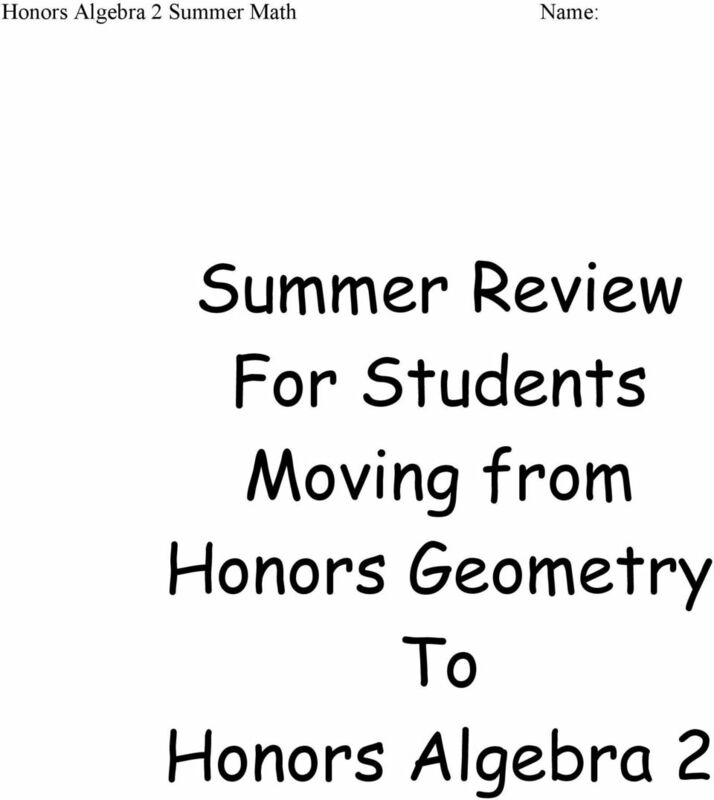 Download "Brunswick High School has reinstated a summer math curriculum for students Algebra 1, Geometry, and Algebra 2 for the 2014-2015 school year." 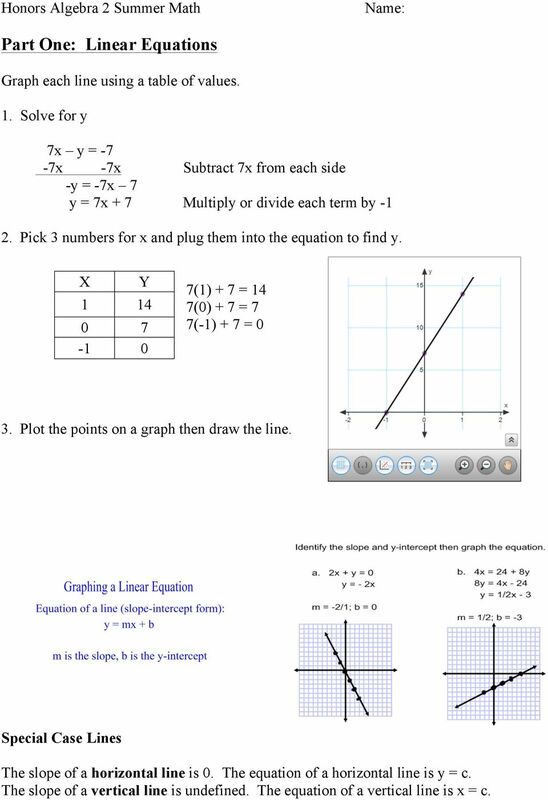 3 Part One: Linear Equations Graph each line using a table of values. 1. Solve for y 7x y = -7-7x -7x Subtract 7x from each side -y = -7x 7 y = 7x + 7 Multiply or divide each term by Pick 3 numbers for x and plug them into the equation to find y. X Y (1) + 7 = 14 7(0) + 7 = 7 7(-1) + 7 = 0 3. Plot the points on a graph then draw the line. Special Case Lines The slope of a horizontal line is 0. The equation of a horizontal line is y = c. The slope of a vertical line is undefined. 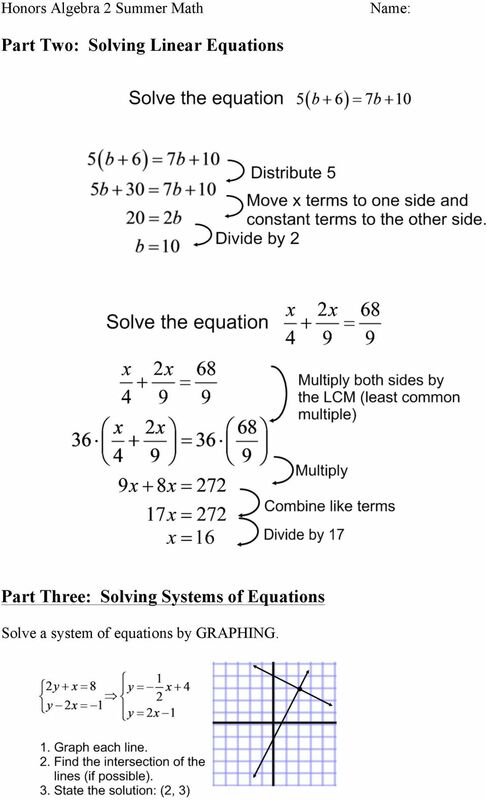 The equation of a vertical line is x = c.
6 Part Two: Solving Linear Equations Part Three: Solving Systems of Equations Solve a system of equations by GRAPHING. 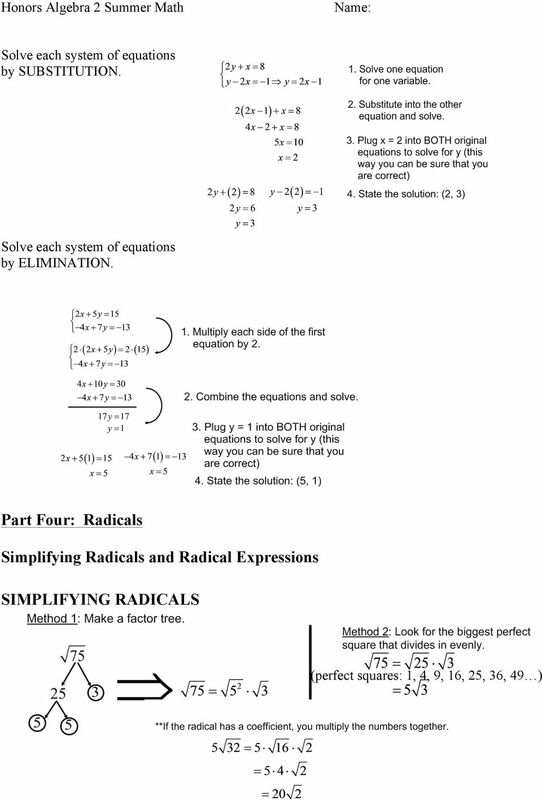 8 Honors Algebra 2 Summer Math ADDING AND SUBTRACTING RADICALS To add or subtract square roots, they have to have the same radicand (number under the radical) =9 5 You may have to simplify the radicals first = = = = 14 2 MULTIPLYING/DISTRIBUTING RADICALS To multiply square roots, you multiply the coefficients together and the radicands together. 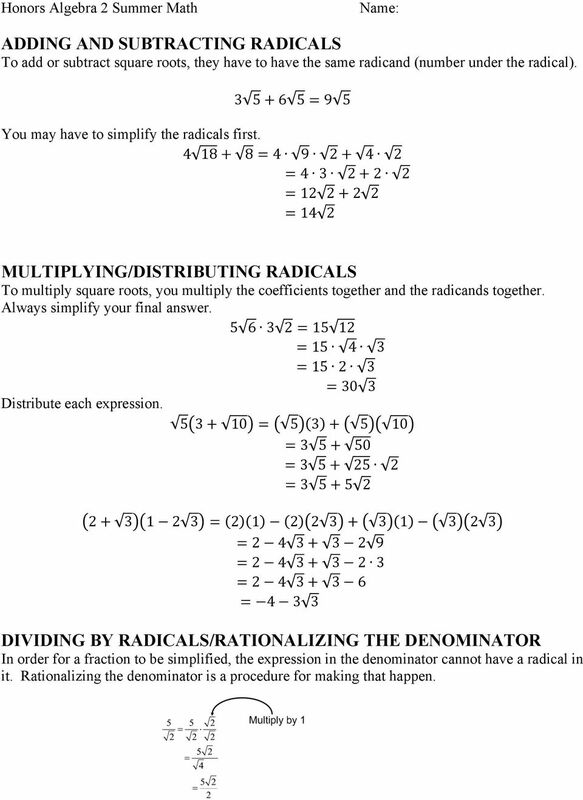 Always simplify your final answer = = = = 30 3 Distribute each expression = = = = = = = = = DIVIDING BY RADICALS/RATIONALIZING THE DENOMINATOR In order for a fraction to be simplified, the expression in the denominator cannot have a radical in it. Rationalizing the denominator is a procedure for making that happen. 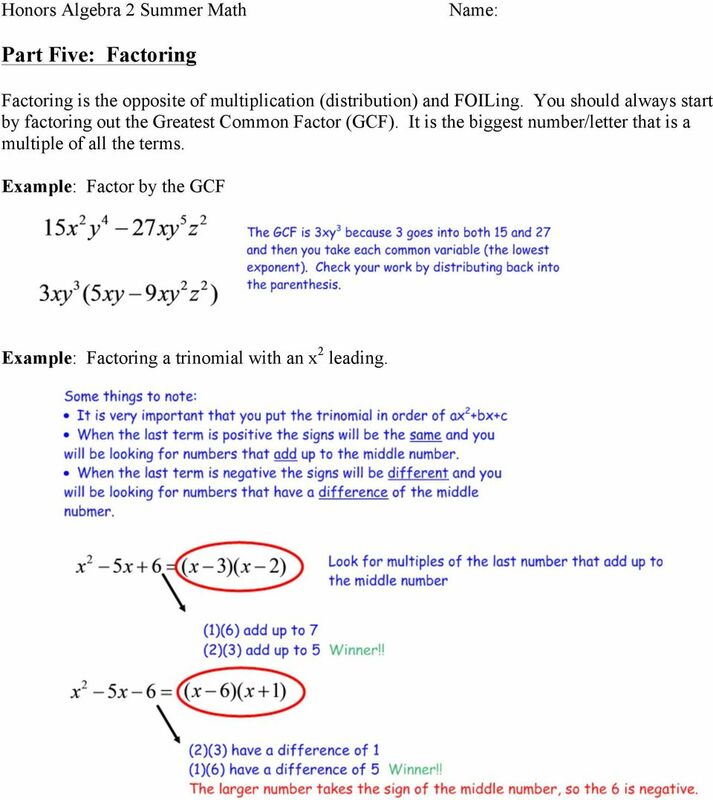 9 Part Five: Factoring Factoring is the opposite of multiplication (distribution) and FOILing. You should always start by factoring out the Greatest Common Factor (GCF). It is the biggest number/letter that is a multiple of all the terms. Example: Factor by the GCF Example: Factoring a trinomial with an x 2 leading. 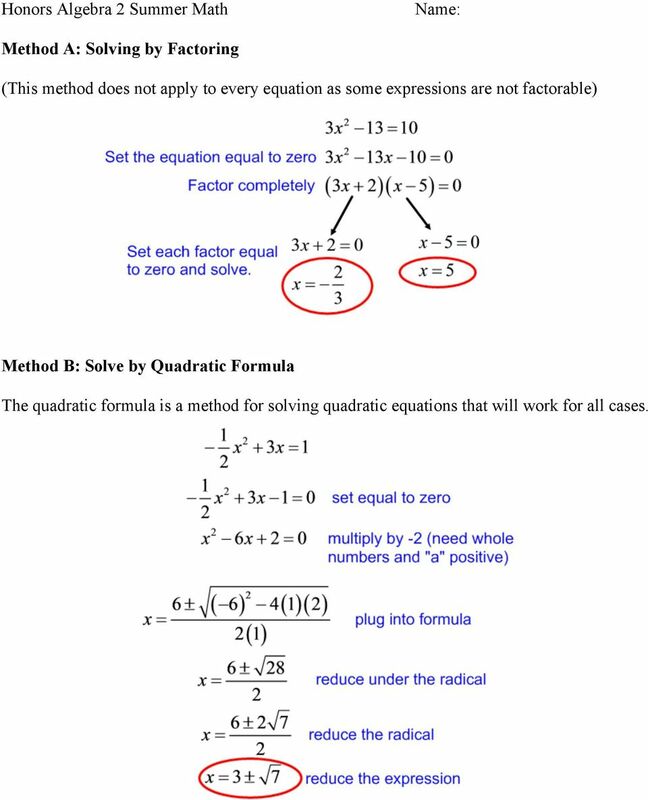 11 Method A: Solving by Factoring (This method does not apply to every equation as some expressions are not factorable) Method B: Solve by Quadratic Formula The quadratic formula is a method for solving quadratic equations that will work for all cases. 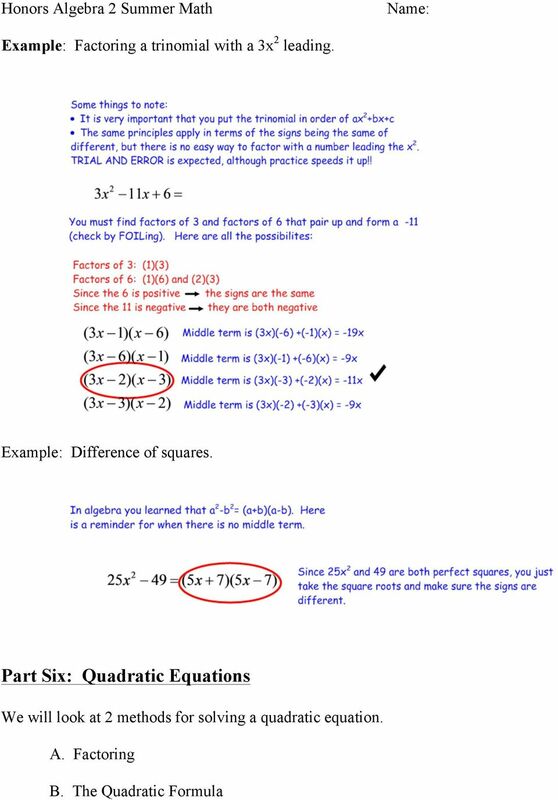 This unit has primarily been about quadratics, and parabolas. Answer the following questions to aid yourselves in creating your own study guide. Warm Up. Write an equation given the slope and y-intercept. 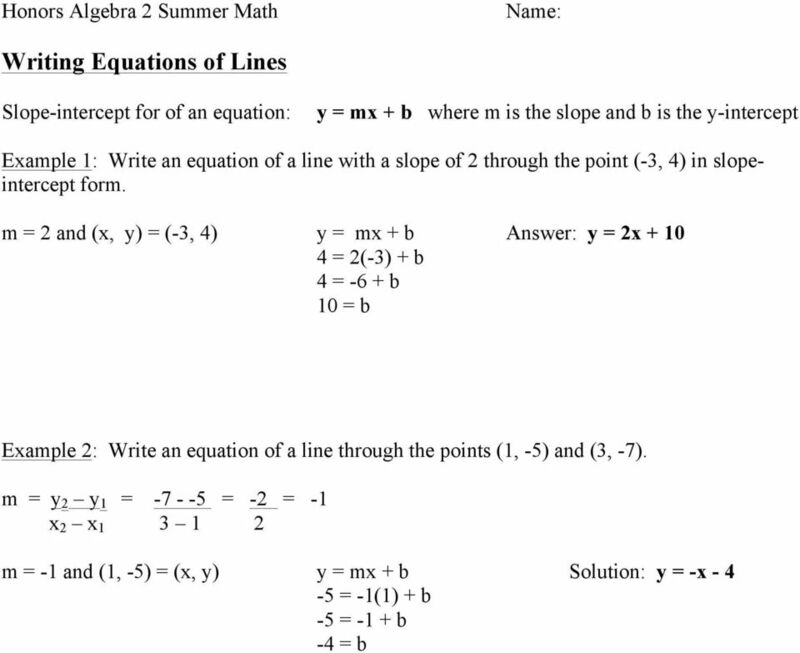 Write an equation of the line shown. 1.6 A LIBRARY OF PARENT FUNCTIONS. Copyright Cengage Learning. All rights reserved. Lines, Lines, Lines!!! 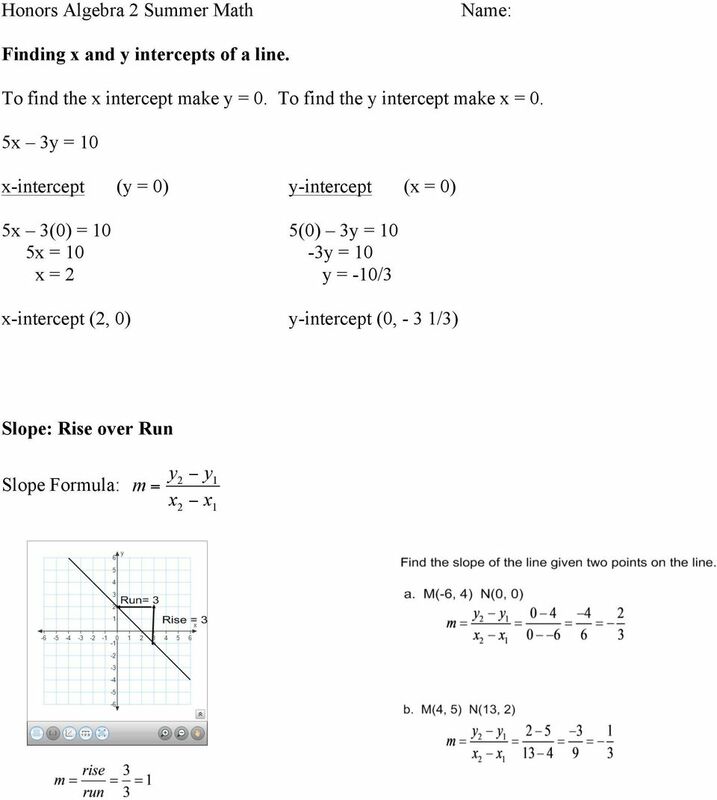 Slope-Intercept Form ~ Lesson Plan I. Topic: Slope-Intercept Form II. III. Goals and Objectives: A. The student will write an equation of a line given information about its graph. Students will be able to simplify and evaluate numerical and variable expressions using appropriate properties and order of operations. is the degree of the polynomial and is the leading coefficient.